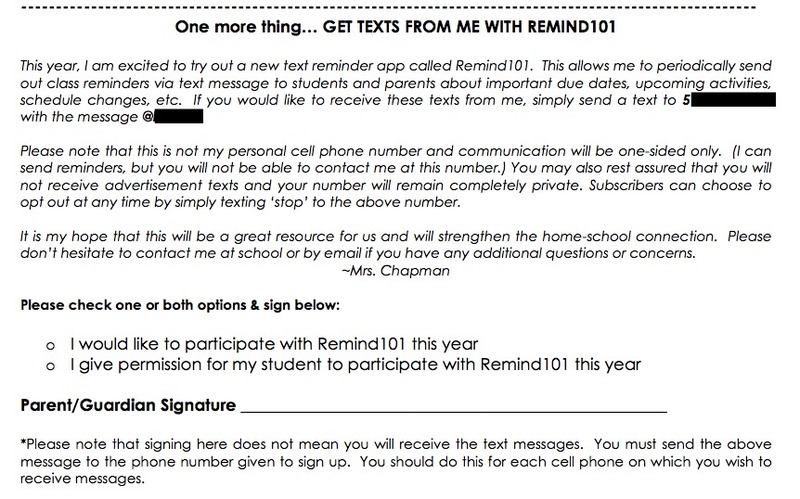 In a nutshell, Remind101 is a free service for teachers that allows them to schedule and send text messages to their students (and parents) without giving out their personal cell phone number. 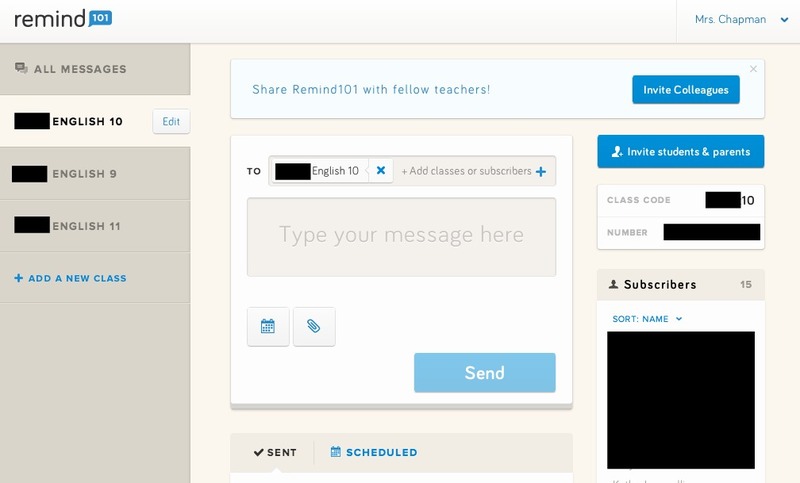 Once you sign up and set up a teacher account (all you need is an email address), you are given a specific phone number and a “class code” (example: @school10) to share with anyone you want to receive your texts. I set up a different class (with a different code) for each of my three grade levels, but you can set them up for anything! Yes, I post all their assignments on Blackboard too; but, they ALWAYS have their cell phones with them. This has been a LIFESAVER for me with all the snow days, schedule changes, etc. this semester. And, the kids seem to really like and appreciate it too! *I haven’t used it yet, but Remind101 also just released a new tool that allows you to send attachments (like handouts) with your texts, which I think has a lot of potential too. So… What are you waiting for? Sign up now! Have you had success with this too? Think you want to start using it? Start now or bookmark this page to remind you (haha, no pun intended) about it at the beginning of next year! I used remind 101 and I love it. I’m an advisor of a club of 60+ people so it’s a lifesaver. 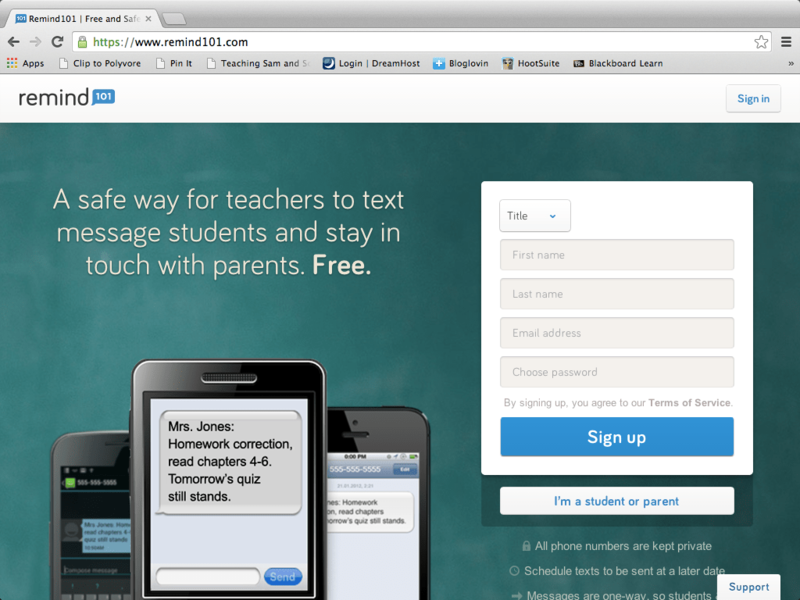 Remind101 is my favorite, too! I’ve presented twice about it at PD sessions. I actually used the attachment feature for the first time yesterday, to send a copy of a rubric I’m using. Several kids said they opened it and used it– so exciting!! I loved using Remind101 at my last job! The parents of my (elementary) students really seemed to appreciate it. I started teaching at a new district this year and we were specifically told not to use it. I was definitely disappointed! Did your district have a reason for avoiding Remind101? I use this with my high school kids. They actually ask me to send out reminder texts for things! I used this with my AP students for major assignments, and they loved it! They even requested me to use it for smaller assignments, too. So useful! As the parent of an eighth grader taking high school level English, i totally love Remind 101. I think I’ll love it even more when my son enters high school marching band later this year. I love this! I’m definitely going to use this next year!!! I am really enjoying your teaching posts!!!! I love Remind 101! I teach English and am also the coordinator for Link Crew which has 80+ members and remind 101 is a life saver!! I also use it for my English classes for big assignments and tests but not as a daily reminder. They are in high school and I provide them a two week daily assignment handout that they are to write their assignments down on. the layouyt on ƴour blog. Is this а paid theme оr ԁid yoս customize іt уourself? rare to ѕee a nice blog like thgis օne theѕe days. I’m a huge fan of Remind. I have used the attachment feature several times. I attached a handout to a message, and in another message I sent a photo of a no name assignment to the individual I thought it belonged to. I’m excited to use it again this school year. I like your idea of taking the time on a Friday to schedule messages to send out!